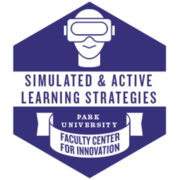 The Simulated & Active Learning Strategies special interest group provides a collaborative learning environment to demonstrate knowledge attainment of real-world experiences in safe, controlled environments. This badge acknowledges participation in a faculty learning community focused on approaches showcasing higher-order thinking, increasing engagement, and bolstering confidence and knowledge. Recipient participated synchronously or asynchronously in a Faculty Center for Innovation-sponsored learning community on the topic of Simulated & Active Learning Strategies and has produced a written reflection on how the knowledge gained has affected his/her teaching, scholarship, or service.